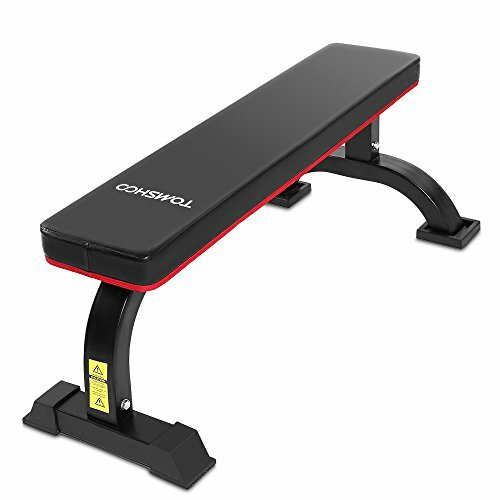 This flat bench allows you to perform a wide range of exercises to achieve a full-body workout, such as toning muscles, flattening abs and losing weight. Its compact space saving design makes it fit in your home perfectly, so you can get all the fitness benefits without leaving your house. Flat weight bench allows for a full body workout to train your muscles and strength. Heavy-duty steel tube construction is built for long-lasting durability. Extra thick foam padded cushion offers ultimate comfort during exercise. Wide base covered with non-slip rubber end caps provides solid stability. Space saving design fits in your home without taking up too much space. Maximum weight capacity up to 300kg (660lbs). Heavy-duty steel tube construction is built for long-lasting durability. Maximum weight capacity up to 300kg (660lbs).